Insights for music lovers and composers: Musical insights into Carole King's "You've got a friend." Musical insights into Carole King's "You've got a friend." There are a few anthem songs of this genre around and I suppose the obvious brother to this is “Bridge over troubled water,” which is equally meritorious. It’s delivered by Carole with passion and sung from the heart on this video. She is obviously amongst her friends who know the song almost as well as she does. She is on record as saying ”the song was as close to pure inspiration as I've ever experienced. The song wrote itself. It was written by something outside myself, through me." …which is surprising, because her intuition makes very intelligent and musical choices. We need to expand our harmonic understanding a little to get inside this song. For ease of comprehension I have moved Carole King’s centre from A/F sharp minor to C/Aminor. It’s simpler for a non musical person to follow if we do, and since the intent is to de-mystify Carole’s thinking, it makes sense to do so. 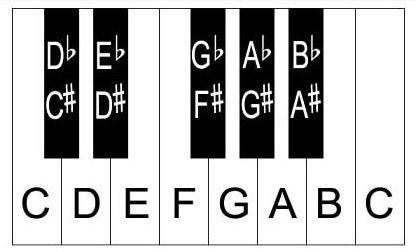 You should recall from earlier discussions, that the order of notes, letter names and numbers starts at C. We can go through the musical alphabet from C many times; Carole just goes past the 1st repetition, to note 9. C = 1 …..the bottom or lowest note. A = 1 …..the bottom or lowest note. It is quite possible for a composer to change tonality/key in a piece. When this happens the music is said to have modulated. Carole modulates several times here, mainly between the two keys outlined above. We may need to understand the difference between a semitone and a tone. If you have ever played a piano and played every single note there is, you will have been moving in semitones. A semitone is the gap from a white note to its nearest black neighbour, or vice versa. If you live in street, imagine this like your next door neighbour - the neighbour lives a semitone away from you. However, if you just play the white notes, you will see that sometimes you cross past a black note. For example, C to D and A to B. If you live in street, imagine this like your next door neighbour - but one- this neighbour lives a tone away from you. It’s a bit of an over-simplification to say tones are brighter than semitones - it depends where in our scale they come. But tones tend to cause less conflict in the music than semitones. This will be important in Carole’s melodic thinking. Having arrived in A minor, she leaves the “if times are hard” bit in this dark tonality, but goes back to the brighter C major chords when the friend offers to turn up at 52”. So there is harmonic empathy between lyric and choice of chord. Dark words = dark chords. Happier mood = lighter chords. This she does for her 2nd verse and chorus too: dark at 1’39” and light at 2’20”. There is a surprising introduction of a ‘foreign’ chord at 2’57” just after she has said “hey now.” It is a chord built on a Black note, and we saw in the ‘rudiments’ that the song has been swinging between two white notes keys of C and A minor. Her chord on B flat pricks up our ears for two reasons: firstly it uses a black note and secondly because she offered us no transition to cushion its arrival. If you listen back to 7” - 10” you may feel the music’s happiness being gradually undermined (if you can call three seconds gradual.) This is also the case from 44” - 51”….I hope you can hear the weight of the music lifting as she moves from dark to light. But at 2’57” she offers us no warning that this foreign chord will emerge. It’s introduction is dramatic and helps mark a new section in the song which is often referred to as ‘the middle 8’ because it normally holds 8 bars of music. For Carole, it’s a middle 10. Carole understands very well the power of the semitone. You may recall that we said harmony in chords is typically built on the interval of a 3rd. The chord of A minor has 3 constituent notes, each a 3rd apart. These are A, C and E. But listen at 13” to the word “troubled” and look at the music below. You will observe that she goes out of the normal harmony - reaching a note of F, the 6th note in A minor. Look at how she approaches and leaves it. 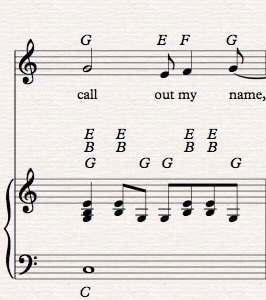 It is book-ended by two notes of E, and the gap from E - F (and F - E) is a semitone; this is a very striking use of that gap and Carole, being aware how it males our toes curl, places it on her lyric “troubled.” The choice of semitone there is inspired and certainly no accident, even if we accept her “inspiration” explanation. The vocal range of this A minor section goes from C to the next C, an interval of 8 notes. This is exactly the same intervallic range as the brighter C major section but in the C section the gap is E to the next E. When she does finally arrive at that top note of E, it is at the climax of the chorus’ she sings “and I’ll be there” at 1’23” , the BE coinciding precisely with the highest note in the melody. So there are in effect two arches in the song” the lower one taking us from C to C in the minor section and the higher arch taking us from E to E in the major section. Arches are common in melodies, two arches is less frequent and is a testament to her natural skill as a tunesmith. The notes C, D and E which start the verse are the 3rd, 4th and 5th notes of our A minor scale. The notes that start the chorus are E, F and G - the 3rd, 4th and 5th notes of our C major scale. So there is thematic concord between her two melodic opening of verse and chorus. It could be argued that understanding how she plays piano on her song isn’t central to understanding the songwriter’s craft. However, it’s the instrument providing the motoric thrust through the song - the only instrument here and thus how she uses it helps us get inside her thinking as a writer and an artiste. Looking at the 4 beats which commence at 24” is very useful, not least because the camera focuses on her hands at the keyboard. You will notice that when the right hand plays, the left hand does not - and vice versa. If you tap your fingers of the right hand on a desk followed by the left hand fingers and say “right left right left right left right left” as you do, you sense the perpetual motion nature of your activity. Carole is more sophisticated than this most of the time, employing notes which don’t come on the beats (known as syncopations) as well as notes that do. She lets the hands coincide generally at the start of every chord change and for important moments of pianistic assertion when she is not singing. Look at 28” for an example of this. You may feel how the hands are together but not on the beat. Carole seizes shorter moments of interlude from vocal to ask the piano to be more melodic too. Compare the texture at 32” (where the piano is hard to sing) to the texture at 36” (where the piano is easy to sing.) At 22” after the word “nothing” you will hear her right hand execute some rapid semiquaver notes to fill the void. She points these up by hitting the piano keys harder with what is known as an accent. A similar device is used at 43” after the words “brighten up,” although the attentive ear may notice the exact location with in the chord of these rapid notes is delayed the second time. Typically, Carole uses a chord arpeggiation to provide movement in the piano. Look at the piano in the 1st bar of the chorus, (52”.) The chord in question is known as C major 7. If you tap this pattern out on your desk whilst counting, you will get an insight into how a piano can activate a chord, and how Carole King does at the start of the chorus. If you are not already there, pop along to http://www.everyheartisasong.com/listen.html and listen to some new songs.